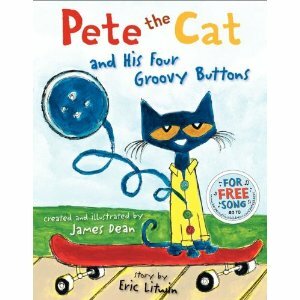 I read the new Pete the Cat book with my kidlets last week. They loved it - no surprise there! If you don't know Pete's new book, here is a teaser - I am sure that you will like it too. Now during "quiet" reading time the kidlets are singing three Pete songs ...but, it's all good. So, I painted myself some Pete buttons and put together this counting activity. I am thinking it could be used in a pocket chart or matching ... I am sure that you and your kidlets can think up more ideas than I can. Click on each of the graphics for your free download. I have some more ideas up my sleeve and on my desktop, but the great outdoors is calling my name and I must answer. I chose this post as my "Daily Read" on my facebook page! I love these books!! LOVE your freebie, Sandi! Thanks. Thanks for sharing the counting activity! I'm your newest follower. Your blog is cute! I'll come back and visit again! Come visit me sometime. I teach 2nd grade. I'm a new follower - I found you on Manic Monday! I LOVE Pete too. Is it just me.....I can only get the second age (4, 5, 0) on the awesome freebee. I would really appreciate the first page. I played with the link and it is back working again. Wow! This is great. Thanks for sharing!